Mack Brown will crush you at Jenga, Hungry Hungry Hippos, Connect 4, and more. Another year, another great ESPN College Gameday commercial with Mack Brown being hilarious. 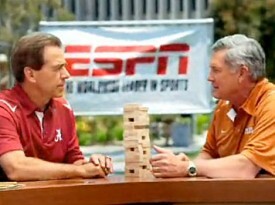 Almost all ESPN and Gameday commercials are great and have quoteable lines, in this one it’s “Jenga, Texas style baby!” from Mack. Last year’s “We don’t freestyle Texas Fight” was even better. Alabama coach Nick Saban isn’t quite as comfortable as Brown but he does deliver a good line and it’s good to see him trying to have a little fun.